Sorrento, Capri, Pompei, Positano, Amalfi Coast, Matera, Alberobello and the best of Apulia. En route stop in Pompei and visit one of the most incredible historical sites in the world. At the end, continue to Sorrento and enjoy a tasteful lunch in a typical trattoria. After lunch learn from your tour host about Sorrento and your activities in town. Tonight the dinner will be served in a local restaurant in the heart of Sorrento. Today, visit of Capri with guide. Capri is an enchanting and picturesque island made of limestone rock. A “paradise of idleness” surrounded by the bluest of seas; the dramat- ically beautiful, flower-covered Island of Capri has been enchanting vis- itors for centuries. Return to Sorrento late afternoon. Overnight in Sorrento. small beaches, the Saracen and medieval watch towers, the narrow roads make of this place a unique in the world, so precious to be listed in the UNESCO World Heritage. Enjoy the magnificent view of Amalfi Gulf from a relaxing terrace, where you will pick up you own lemons from a lemon tree an prepare a cold lemonade. Return to Sorrento. Farewell dinner will be served in a panoramic restaurant on the hills of Sorrento. After breakfast, transfer to Apulia region along the beautiful ancient road that connect the west of Italy to Adriatic Coast, in front of Greece. En route stop in Matera and free time to visit the town. Matera has gained international fame for its ancient town, the “Sassi di Matera” (meaning “stones of Matera”). The Sassi originate from a pre-historic settlement and have been inhabited since thousands of years without interruption. Early afternoon, continue to Polignano, a magnificent small village on the sea. Dinner at hotel and overnight in Polignano. The morning is free to enjoy the village of Polignano, go tho the beach or just relax. In the afternoon, meet your driver for a full immersion in Apulia way of live. The first stop is Alberobello, the town protected by UNESCO for its unique architecture of Trulli. 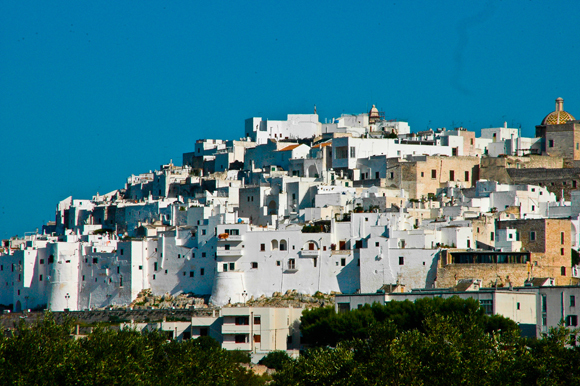 Continue to Ostuni, the white town, then enjoy a tasty dinner in Castel- lana, with the best of local tradition. Today, private guided visit of Lecce, the city of Baroque, a glorious ar- chitectural confection of palaces and churches intricately sculpted from the soft local sandstone. In the afternoon, return to hotel and free time in Polignano. Dinner in a local restaurant in town. From €2000, per person, based on double occupancy. Single room package from€2700 .